Not many people know that AGMA is an international association with an American name. AGMA has about 430 members, with more than 100 located outside of the United States. AGMA has members in 32 countries. For the first time we held a meeting for company executives outside of North America—in Budapest, Hungary—the week of September 14. Executives from eight countries met for three days to discuss proven principles for growing their company through diversification. Leadership is critical to any successful diversification and growth, so the group also discussed two aspects of “the mind of the leader,” growth and culture. The conference facilitators were two individuals who know the industry well, Dr. Randall P. Kunkel and Steven Barnhart. Randy is CEO of Catalyst International, a consultancy focusing on human potential, achievement, and leadership. He has presented at several AGMA meetings. Steve works with the Illinois Manufacturing Extension Center [www.imec.org], an affiliate of the U.S. Department of Commerce’s Manufacturing Extension Partnerships. He will be a keynote speaker at the 2012 AGMA Annual Meeting. In addition to presentations and discussions on growth, market diversification, and leadership development, attendees were able to talk with Dr. Wendel Schindele, CEO of Wentech International, about the market in Central Europe, and specifically Hungary. Dr. Schindele and Wentech have helped a number of businesses develop relationships and open facilities in Hungary. Finally, we heard from Paul Sunderland, a market analyst from IMS Research [www.imsresearch.com] on its just-released study on the market for gear motors and gearboxes. The key to the success of the conference was the focus on valuable learning for CEOs—attendees were CEOs and their senior advisors—and on the networking possible in a three day meeting. When we left on Saturday everyone knew everyone! For anyone who has attended an AGMA Annual Meeting, you know that networking and learning are basic values for AGMA. Randy Kunkel established the tone for the meeting in the first session, “Hidden Gifts of the Leader.” The entire conference was as much interaction and sharing as formal lecture, and he led the group as each person identified his own and understood that a leader’s “gifted intelligences” are strengths that many of us don’t immediately recognize. This was a meaningful and powerful beginning. Steve Barnhart presented his “Keys to Successful Business Growth-Five Guiding Principles.” The presentation details how to grow your business through new markets and expanded networking. The discussion covered: the key operational issues that promote success; techniques of innovative companies; and how to evaluate your company’s readiness for growth through market diversification. The program integrated a presentation on the joint venture between Schafer Gear Works of South Bend, Indiana, and Somaschini S.p.A. of Bergamo, Italy, named South Bend Gear, LLC. Participants compared the real-world example of the joint venture with the five principles for growth and diversification. Growth through diversification requires strong leadership, and the session “Inside the Mind of the Leader-Conversations about Growth” helped participants sharpen their ability to lead teams effectively, to transform entire organizations, and to achieve ambitious goals comes from the mastery of a specific set of skills. Everyone who attended already possesses the relevant leadership skills, but the expert presenters at this conference introduced new ideas and brought together peers in the industry to share their stories and case studies of how they have successfully diversified their companies. The meeting was in Budapest because of our relationship with Dr. Wendel Schindele and his international business Wentech International [www.wentech.hu]. Thanks to him the group was able to tour the Audi facility in Gyor, Hungary, about 90 minutes from Budapest. At the plant Audi Hungaria Motor Kft. develops and manufactures engines for AUDI AG and other companies of the Volkswagen Group. In partnership with the Ingolstadt plant it also assembles the Audi TT Coupé, the Audi TT Roadster, the Audi A3 Cabriolet, and the Audi RS 3. About 80 percent of Audi’s engines worldwide are manufactured in this facility. In addition to the plant tour, Dr. Schindele discussed “Market Opportunities in Central Europe-Growing through New Markets.” His discussion touched on existing and potential markets, strategies for entry, and keys for long-term success. The final session was a presentation and discussion titled “Inside the Mind of the Leader, Conversations about Culture.” Dr. Randy Kunkel helped the group examine essential strategies, concepts, and insights into doing business in a global economy that requires cross-cultural understanding and expertise. AGMA’s International Business Conference was designed to present new information to the diverse audience from eight countries—India, Japan, Australia, Belgium, Germany, Italy, Canada, and the United States—but the real value was learning with your peers from around the world. Networking is a fundamental objective of most AGMA meetings and this was no exception. The group participated in formal learning sessions and tours of Audi and the city, as well as meals together. And you can’t forget the less-formal meetings of the “lubrication committee” after dinner. Through generous support from the AGMA Foundation, AGMA has recorded the popular Gear Failure Analysis live course to preserve this important work and to provide wider availability. 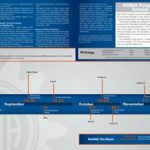 This year celebrates the 20th anniversary of Gear Failure Analysis. 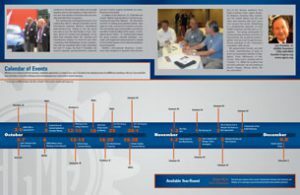 In 1991 the American Gear Manufacturers Association first offered the advanced engineering seminar presented by Robert L. Errichello titled Gear Failure Analysis. Since its inception this program continues to evolve and has been offered more than 40 times, with more than 1,200 students participating. This course has been offered twice each year and sells out each time, with waiting lists for future offerings. Given the success and longevity of this course we feel it is an important contribution to the body of knowledge in the field and should be preserved and available to engineers throughout the world, as well as to present and future instructors. With the always changing economic conditions and our growth in global members, AGMA has created an alternative online training option for Gear Failure Analysis. This project creates a distance learning course for those individuals and corporations that wish to participate in gear industry advanced engineering continuing education, but cannot travel to participate in person. Errichello heads his own gear consulting firm, GEARTECH, and is founder of GEARTECH Software, Inc. He is a registered professional engineer who holds bachelor’s and master’s degrees in mechanical engineering, and a master of engineering degree in structural dynamics from the University of California at Berkeley. He helped to introduce the world’s first gearing standard for wind turbines and is very active in AGMA standards development and nomenclature. He has extensive teaching experience and has taught college courses on machine design, fracture mechanics, vibration, and material science. He has over 40 years of industrial experience, is author of more than 60 articles on design, analysis, and application of gears, and has written three widely used computer programs for the design and analysis of gears. He is a recipient of AGMA’s prestigious Lifetime Achievement Award and a recognized expert in Failure Analysis. In Gear Failure Analysis, Errichello discusses six classes of gear tooth failure/overload, bending fatigue, Hertzian fatigue, wear, scuffing, and cracking. Possible causes of these failures are presented, along with suggested ways to avoid them. The filming of this course took place during the June 27-29, 2011 seminar. We are currently in the editing phase of this project, which will yield 11 segments containing 10 hours of content including an extensive course manual. The course concludes with a test to validate learning. Participants receive a certificate upon successful completion of the exam. The completed learning program is available for purchase via the AGMA Web site. 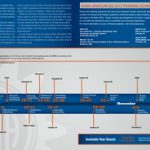 The online version of Gear Failure Analysis is the second of a series of video-based learning modules. 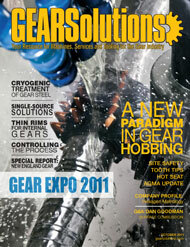 The online version of Detailed Gear Design presented by Raymond Drago, P.E., debuted late last year. In addition to the two vided-based courses, the collection of online training courses developed with funding from the AGMA Foundation also includes three self-paced slide courses: Fundamentals of Gearing, Parallel Gear Inspection, and Hobbing. 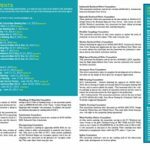 What Has the AGMA Foundation Done for You? Solving ‘The People Impact’: How can AGMA help?